The first sign of Christmas in the city is the splash of color dissecting Paseo de Reforma, the major, vibrant artery of centro D.F. One day in early December the brilliant red of the nochebuenas (poinsettias) replaces the yellow-orange of the cempacuchiles (Aztec marigolds) planted for the early November Day of the Dead celebrations. Nochebuena is also the name given to a bock-type beer sold in Mexico only during the Christmas holidays. As with all festivities in Mexico, the Christmas holiday celebrations are not short ones, lasting from the beginning of December all the way to February, though the majority of partying and praying takes place from December 12 through January 6. Although it’s true that many Chilangos (citizens of Mexico City) hit the beaches for Christmas holidays, this migration doesn’t take place until after December 20, and many tourists from the provincia as well as extranjeros come in for the weeks surrounding Christmas and New Year’s. If you’re planning luncheon, comida, breakfast, or dinner with friends at a restaurant, best to make reservations for the early December dates. Traffic in the city is horrendous, and restaurant tables fill up quickly at this time with business and club luncheons. Decorations in the Zocalo begin to appear early in December. Tourists and locals alike enjoy ice skating in the outdoor rink built specifically for this holiday, with ice skates provided. Just bring your courage! Tobogganing and snowman-making workshops for the kids are also popular. Not to worry, the temperatures don’t fall below 32 degrees F. The temperature is controlled from underneath the exhibits to provide ice for the rink and snow for the other events. 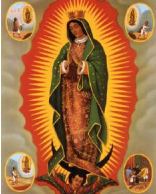 VIRGIN OF GUADALUPE CELEBRATION: DECEMBER 12 is the day it all begins (although in Oaxaca the Virgin of Juquila is grandly celebrated on December 8). Catholics go to their local churches or to the Basilica of Guadalupe, located in the north of the city. Think twice before visiting the basilica on this day as there are hundreds of thousands of people that make the pilgrimage, many having traveled from all over the country (and world), praying and walking on their knees to honor the Virgin. It begins on December 11 in the evening. Best to watch the celebration from the basilica on TV (Televisa Channel 2), beginning at 11 pm. The Virgin appeared to campesino Juan Diego on this day in 1531. Non-believers plant a seed of doubt into the tradition, speculating that it was a deception played by the Spanish to convert the Indians to Catholicism. The celebration of the posada (the Spanish word for “inn”) varies from city to countryside, but the basic premise is the same. Each of the nine nights, beginning December 16 and ending December 24, represents Mary and Joseph’s search for a room at the inn. In the cities, the posadas take place in various neighborhoods, but in pueblos the festivities include the entire town, including tourists. Food abounds, everything from tamales, tacos, and pozole to hot chocolate and agua fresca. Traditional songs representing the search and rejection of a place to stay are sung by the revelers and, finally, at the representation of last house visited, everyone is invited in for a small fiesta, complete with a piñata for the kids. Christmas Eve, the night of the last posada, however, is the big fiesta, often with music and dancing. At midnight the statue of the Baby Jesus is brought out and placed in his manger. Everyone takes a turn rocking the new baby to sleep, boys and men included. CHRISTMAS EVE: DECEMBER 24, rather than Christmas Day, is the moment of true celebration for families. Travelers often look for Christmas Day fiestas, but there aren’t any. You may even have trouble finding restaurants open. On Dec 25 everyone rests from their big Christmas Eve revelry, which begins late in the day on the 24th and continues until the wee hours of the morning on the 25th. The traditional meal is eaten late, often after midnight, the most popular Christmas Eve dinner being bacalao (a dried cod). This dish is quite challenging to prepare, both time- and labor-intensive: the fish must be rinsed several times thoroughly before adding the additional ingredients and spices. Accompanying it will be the marvelous romeritos (the actual romerito is a sprig of a plant similar to rosemary). These sprigs are combined with dried shrimp, potatoes, and mole to create a taste treat unfamiliar to the palate of most gringos. An accompanying apple salad resembling a Waldorf salad is also always served. Not to worry about finding any of these items as grocery stores and markets display all the ingredients for your convenience. As mentioned earlier, Christmas Eve is the last night of the posadas, with the statue of the baby Jesus presented at midnight and placed in the manger. THREE KINGS DAY: JANUARY 6 is the day of gift-giving for the children! In Mexico City during the days preceding January 6 you’ll find live groups of the Three Wise Men listening to the children’s wishes. Alameda Park, next to Bellas Artes in centro, features a lineup of Wise Men with whom you can have your photo taken. On this day, a traditional coffee cake is served. Called a rosca, you’ll see them piled high in boxes in every bakery and grocery store in Mexico this time of year. What makes it different from a plain cake/bread is that hidden inside the rosca is a small plastic baby Jesus. The person who is lucky enough to find the baby in his or her morsel will have the honor of bringing the tamales to the Candelaria celebration (February 2), or in some parts of the country to actually host the fiesta. CANDELARIA: FEBRUARY 2 Falling 40 days after Christmas Day, this holiday represents the end of Mary’s period of reclusiveness and the day she brought the baby Jesus to the temple to be blessed. Thus, on this day, people throughout Mexico dress up dolls and present them to the church to be blessed. Depending on your locale, the celebrations usually consist of yet another fiesta, this time with tamales and atole. It’s on this day also that the baby Jesus is taken from the manger and put away until his appearance the next Christmas Eve. Certainly these two months are the most festive time of year in all of Mexico. As regular visitors to this grand country already know, whenever and wherever you visit you’ll find a fiesta, a welcoming smile, and an invitation to share in the traditions. ¡Feliz Navidad y Prospero Año Nuevo a todos de Carole! Previous PostJewish Charities in MexicoNext PostHow to Buy Happiness!